You've noticed that I've been busy lately, sorry to drop out like that. Lots of work and some work travel, and things just pile up. I'm trying to get better about work travel, as it has become an inescapable fact of life for me, and it seems like it will get worse before it gets better. There are a few simple things I'm trying to do now that make it easier. 1) Travel light - sounds obvious, but I've begun taking it to the extreme. I pack almost nothing, try to fit whatever I need into a large laptop shoulder bag. Yup, I'm that guy with underwear in his computer bag. I cannot bring myself to wear lace-less shoes, and it's not for lack of trying. They just look so dorky on me. 2) Leave the house clean - coming home to a clean house just feels better. 3) Leave something easy and comforting in the fridge to cook when I get home. It cam be tempting to go out to eat after work travel because it's easy, but it's so much nicer to put on some music and make something at home, and to open a pleasing bottle. 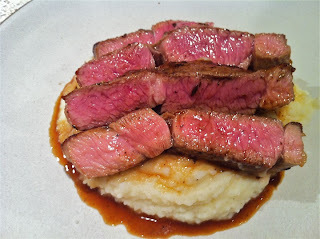 Upon returning from a recent work trip I made the simplest of comforting meals - steak and mashed, and a salad. I feel like people think there's some sort of trick to making good mashed potatoes, and I just don't see it. Why is this tricky? I peel and coarsely chop a couple of russets (they cook quickly and have the right texture when mashed), put them in a pot of salted water, bring to a boil, reduce to a simmer, and test them until they give easily to a fork. Then it's through the potato ricer, and here is where the magic happens. The still hot but now ground potatoes are begging for seasoning, and they will readily accept whatever you give them. I keep it simple, with a glug or two of buttermilk, a pat or two of butter, a shake or two of salt, and a grind or three of black pepper. Honestly, it's hard to argue with the results. Although I am still a believe in this method of cooking steak, the just-returned-from-work-travel mood doesn't allow for 25 minutes in the oven. I just pan fried this baby, let it rest, sliced it thick, whisked a little sherry vinegar and soy sauce into the pan juices, and went to town. This has got to be one of the easiest dishes as far as wine pairing goes, it's hard to go wrong. This was comfort food night for me, after work travel. I wanted something familiar that would offer a pure form of pleasure. The problem is, the wine just wasn't very satisfying. 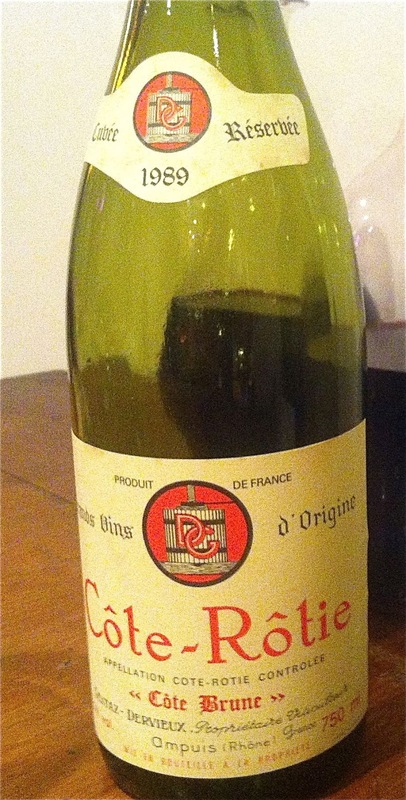 I drank the 2007 Coudert Fleurie Cuvée Tardive on only one other occasion, about 5 years ago at a friend's house. I remember thinking that it was entirely closed aromatically and on the palate, which is to be expected at that stage (and perhaps still now), but I also remember thinking that the wine just didn't feel right. It had a murky quality, a lack of clarity that bothered me. But this is 5 years later and 2007 shouldn't be the type of vintage that requires a million years to reveal its charms. Shouldn't this be approaching drinkability now? Who knows? The wine was still tight as a drum aromatically and on the palate - I mean nothing doing. Dark, dark, dark, and impenetrable. And then three hours later, the sun shone in and the veil lifted, and the wine showed lovely fruit and a nice clarity of flavor. Okay, I thought, this wine is just too young. And it probably is too young to drink now. But it never really stayed clear and bright - the darkness returned, especially on days 2 and 3, and by day 3 it seemed to be going downhill. I am not familiar with the aging curve of Cuvée Tardive, and maybe I made a classic mistake in opening the bottle at this age. But I also think that the wine has a murky quality, a blurriness to the flavors that isn't terribly appealing. 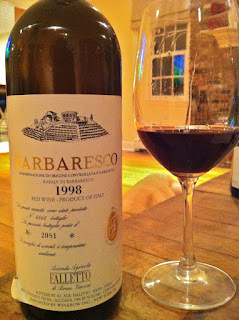 It's hard to accept that from a producer that I know and love - could it really be a not-so -great wine in 2007? No matter. My dinner was comforting, and even though I didn't love the wine, it was comforting too. A familiar drink can be comforting even when it's not as delicious as it usually is. 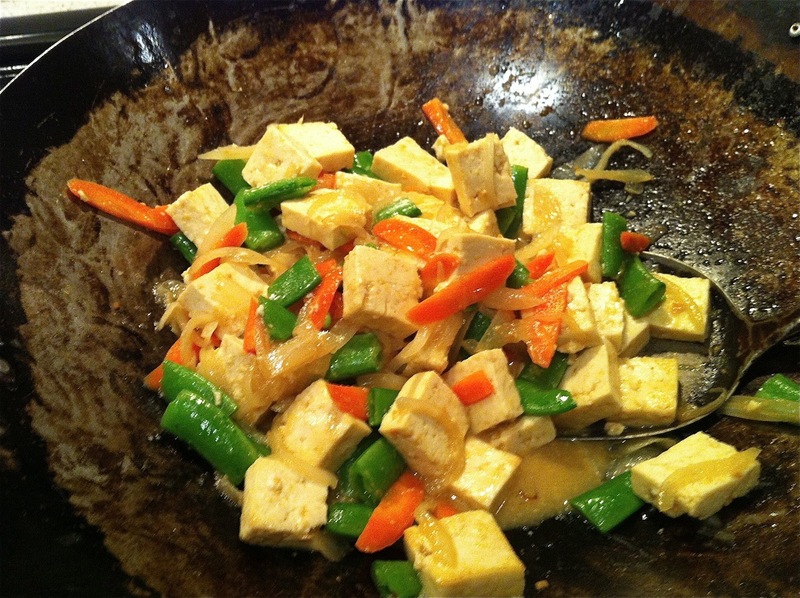 I've been trying to cook Japanese food lately, and I've succeeded in cooking Japanese-style food. It's amazing how far you can get with a couple of miso pastes, some kombu (dried kelp) and dried shaved bonito flakes, some mirin and shoyu. 1) Watch the Shogun miniseries in it's entirety. This is 10 hours of your life well spent. And it gets you into the right frame of mind, as a foreigner attempting to do something Japanese. 2) Slice against the grain 1 pound of flank steak (but you can use other similar cuts) into pieces 1 inch thick, but leaving them the width of the steak. Brown the meat and remove from the pot. 3) Cut a large onion in half and slice it with the grain into long thin strips. 4) Peel two russet potatoes and cut them into chunky half moons, chunky enough to hold together in a braise. 5) Peel a decent sized knob of very fresh ginger and grate it finely. 6) Mix together a quarter cup of good quality mirin with a quarter cup good quality shoyu, and 1 cup of good quality hand-poured water. This is the ratio that I like, but you can add more shoyu or mirin - they are strong flavors though and this combination is nicely balanced. 7) Saute the onions in the beefy pot, but don't brown them. After they have cooked for a few minutes, add the ginger and mix well. 8) Add the braising liquid and bring to a simmer. 9) Add the beef and the potatoes, bring to a boil and immediately turn down the heat to a simmer. 10) Cover with a Japanese drop-lid, or if like me, you don't have one, cover the pot with a damp piece of parchment paper and a tight-fitting lid. Every 15 minutes or so move the stew around the pot to make sure that all the meat and potatoes have a turn being submerged. 11) When the meat is very tender, maybe 90 minutes, turn off the heat and let the whole thing rest for 10 minutes or so. 12) Top with scallions and serve over rice. Would it surprise you if I tell you that this dish is fantastic with Fino Sherry? 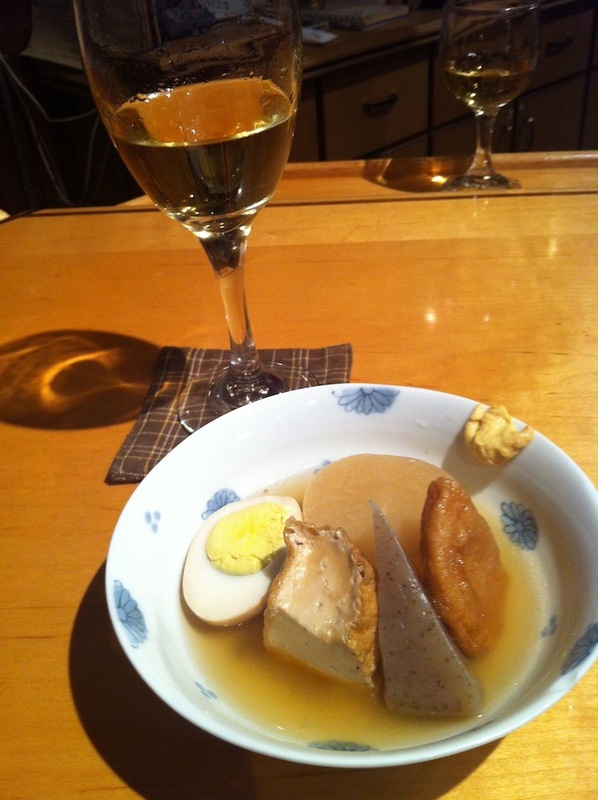 A lot of Japanese food is great with Fino Sherry. There is the umami factor - Japanese home cooking and Sherry both have it, and they compliment and elevate each other tremendously. But it's more than that. 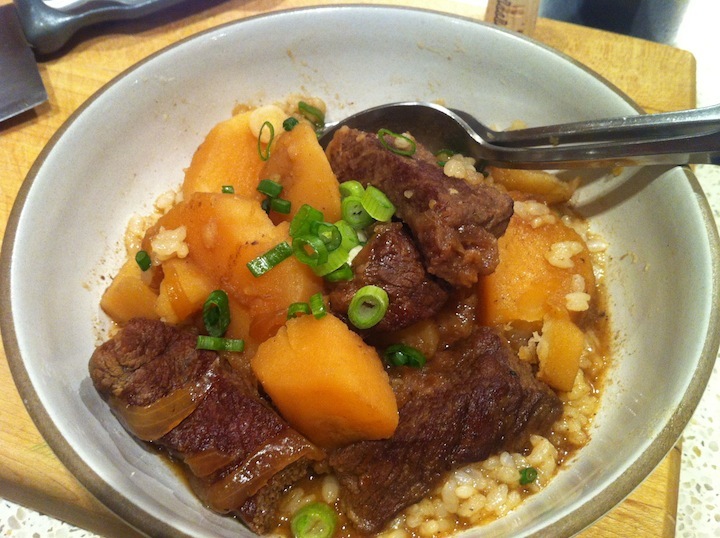 As I understand it, one of the ideas in Japanese cooking is to bring out the essence of the ingredient, to accentuate the beef's beefiness, or the radish's radishiness, if you will. Fino Sherry, with its very pure chalky saline and savory flavors somehow enhances the purity of the flavors in Japanese dishes. One night I drank Emilio Hidalgo's beautiful Fino called La Panesa with this dish, and I swear to you it was as good a pairing as any I've had in a very long time. On another evening I made a simple Savoy cabbage, daikon radish, and pork dish, simmered again in a light mixture of mirin, shoyu, and water. First of all, this is seriously delicious. 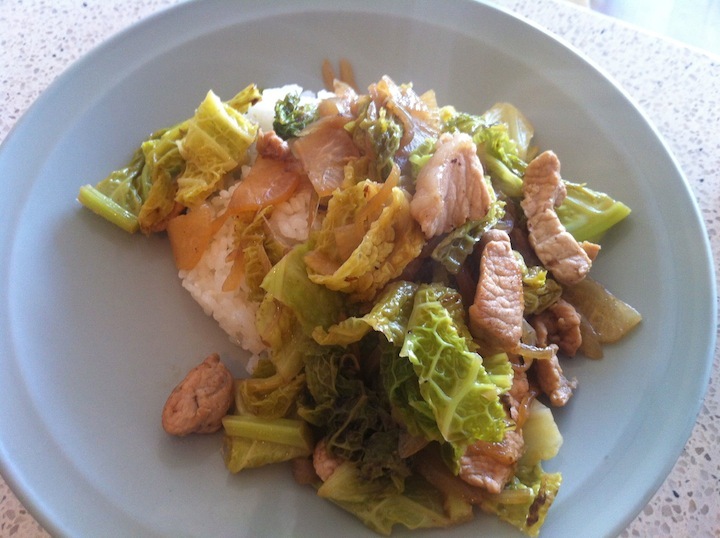 My young daughters were happily eating Savoy cabbage, that's how good it was. There was half a bottle of La Panesa leftover, and surprise surprise, it was a wonderful pairing. Tonight I made tofu with snap peas, carrots, and onions simmered in a mixture of red and light miso pastes, mirin, and water. Again, the daughters lapped it up - these girls like the savory. 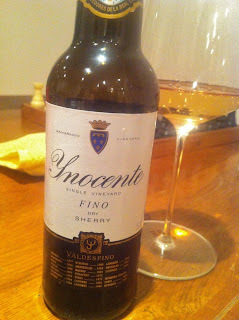 And I drank the old reliable Valdespino Inocente, a spirited little half-bottle. I'm telling you, if you're into Sherry and you haven't tried it with Japanese (or Japanese-style) food, you really should. One day I will learn to make oden like this. Probably not, actually. But at least I had the sense at this restaurant to pair it with the very grand La Bota de Manzanilla No 22. As Morgan Freeman said at the beginning of the movie Se7en, "This isn't over - there are going to be more of these." I'm stuck in the middle of a tough streak right now, friends. 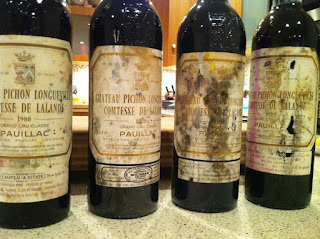 Be very careful sharing your good wine with me, as since early January there have been some incredible disappointments. 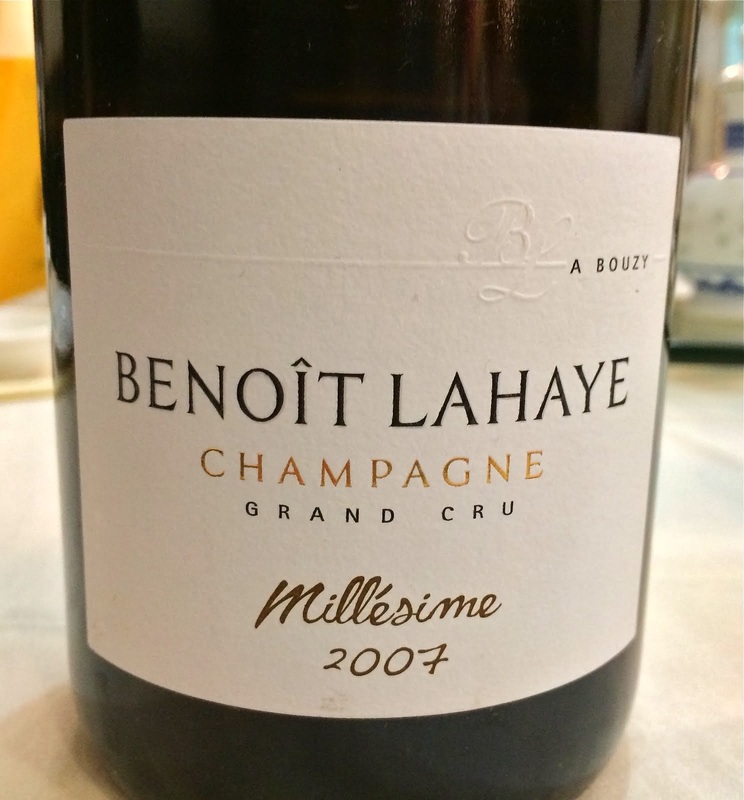 Lately, every bottle that should be great is corked or flawed in some other way. It's starting to spread now to the daily bottles too, which is alarming. 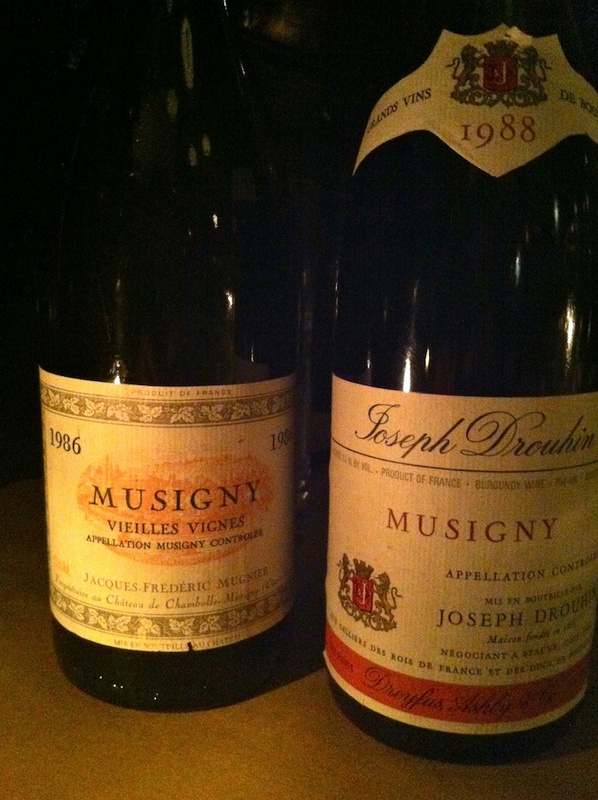 It began with a bottle of 1988 Drouhin Musigny at the annual Burgundy Wine Club dinner in early January. Should have been a brilliant bottle, but it smelled and tasted like roasted peat. This established the tone for the next month. I opened a bottle of 2006 Marquis D'Angerville Volnay 1er Cru Les Fremiets one night and it was corked. That teasing kind of corked, too, where you keep drinking it because you haven't had the wine before and it's not the stinky vicious kind of corked. 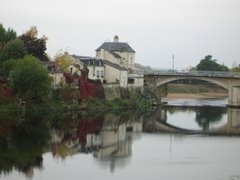 It was the kind that wisps in and out in a subtle way, gradually building, until eventually it can no longer be denied. And then this majestic bottle was corked. Again, it wasn't immediately clear (except to one very experienced drinker). Everyone agreed that something was wrong with the wine, but we all fought as hard as we could to deny reality, for obvious reasons. Seriously, this is tragic, isn't it? When am I ever going to drink 1989 Gentaz again? 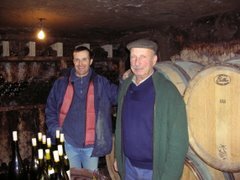 Then one evening last week I decided to try the 2011 Domaine de la Pépière Muscadet Clos des Briords, always exciting to try the new vintage. Corked. Not hard to replace, but still frustrating. 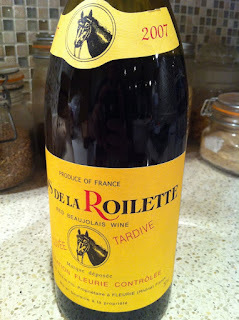 Then on Friday last week my good friend brought a special bottle to my house for dinner, a bottle he bought a year or so ago at my encouragement. 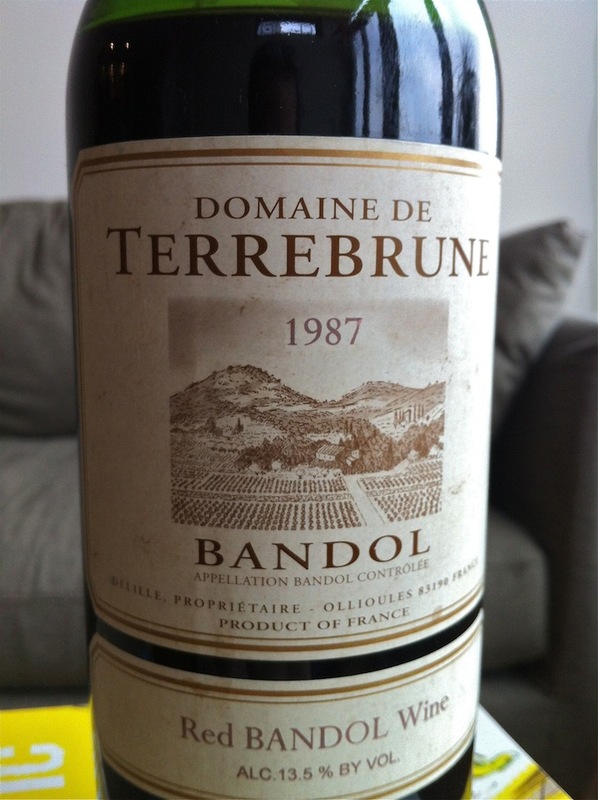 1987 Domaine Terrebrune Bandol, which I've actually tasted before and I'm a sucker for Bandol from those years, when the wines were less bombastic and lower in alcohol (although this one was 13.5%). The problem was, the wine was corked. And in that especially annoying subtle way that took us 30 agonizing minutes to recognize. Was it taking its time opening up, was it a little heat damaged (yes), was it corked, why was it so muted and weird...because it was corked. 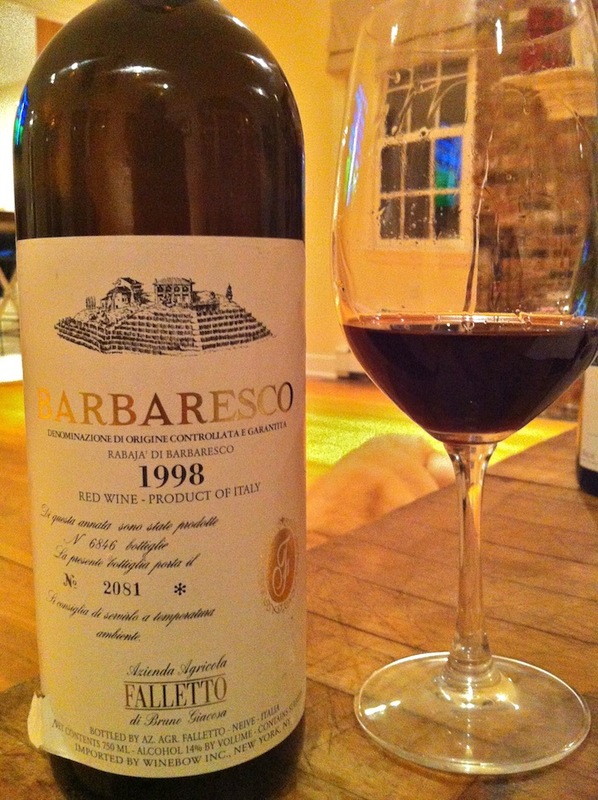 And on Super Bowl Sunday my good pal very generously opened a great bottle to share, the 1998 Giacosa Barbaresco Rabaja. The Bud Light ads were tempting, but this wine had us way more excited. He decanted it for a while and we were ready to go, but the wine was heat damaged. We drank some anyway because it was possible to see the potential of the wine underneath, but I could tell he was frustrated, and I didn't have the heart to tell him that these days, I bring this plague with me wherever I go. My friend Peter said to me recently, joking around, but not entirely, that no where else would consumers allow this sort of failure rate in the products we buy. "Imagine buying a new car," he said, "turning the key and finding that it doesn't go. And then the salesman smiles sadly and says 'Yeah, sorry, that one doesn't go, that happens sometimes and you'll have to live with it.'" Okay, a new car is a bit more expensive (unless we're talking about corked Jayer or DRC). But his point is interesting. 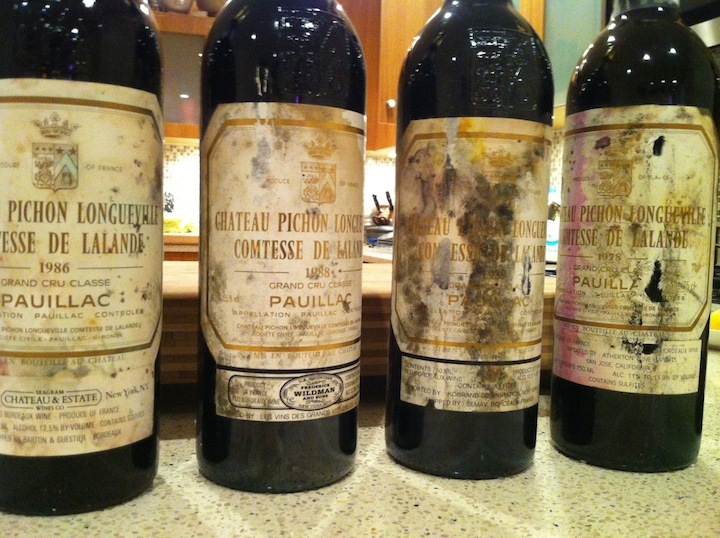 Why have we accepted the fact that 1 of 8 or 9 bottles of wine is corked? We are told that we have to accept this, that it's part of the game. Maybe so. 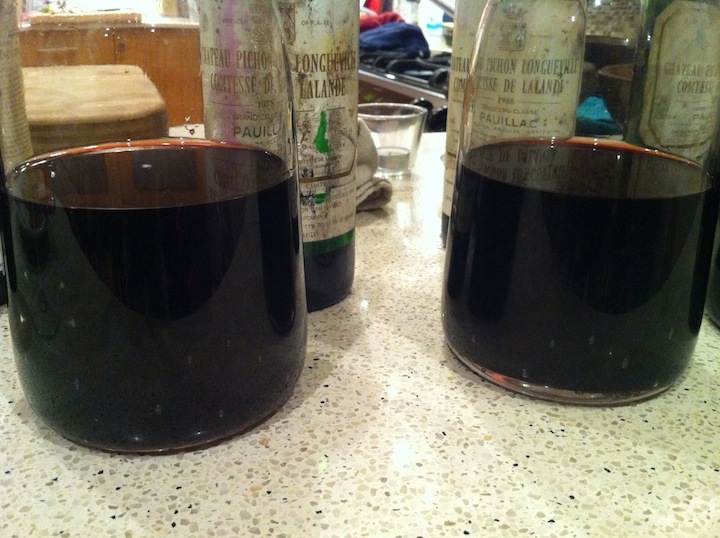 It still stinks, and can be soul crushing if you've invested cellar time and/or a lot of money in the bottle. My friend Lee Campbell who used to sell the Dressner portfolio of wines and now is the wine director at Reynards, among other things, once had me guffawing as we complained about corked wine. She said that she's convinced that lots of things can be corked. There is a small park near her house that she thinks is corked. Certain television shows are corked (I think she said that Glee is the most recent offender), a diner near her office is corked, North Korea is corked. I am worried that I might be corked.